Eventually, like previous dynasties, the Twelfth Dynasty fell. And the Thirteenth Dynasty, at Memphis, waned across its 150 years of rule and fell with what by now was an old phenomenon: invasion by a foreign army, around the year 1650 BCE. The invaders were a literate people with a Semitic language, horses and lightweight chariots. They had moved through Canaan and had taken control of some cities there. Then they conquered northern Egypt and overran Memphis. It is not known who they were, except that the Egyptians called them Hyksos (hyk khwsht), which identifies them only as foreigners. They introduced Egyptians to the wheel and to new weapons of war. They introduced the Egyptians to new musical instruments, new techniques in making bronze and pottery, new animals, new kinds of crops, and new gods – more of the cultural diffusion that was to mark history across the ages. More than a century after the Hyksos invaded Egypt, protracted struggles between the Egyptians and Hyksos resulted in a new pharaoh, the founder of the Eighteenth Dynasty, Ahmose, uniting Egypt and driving the Hyksos beyond the Red Sea. 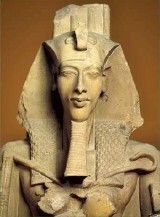 Ahmose reigned from 1539 to 1514. Egypt's elite has been described as compensating for their wounded pride from the Hyksos conquest, and the third king of the 18th Dynasty, Thutmose I (reigning from 1493-1482) pursued the Hyksos through Canaan and into Syria, with the Egyptians supporting themselves by booty as they went. The Egyptians believed they were on a holy crusade and that they were protected by their gods. Amenhotep IV (Akhenaten). He reigned from around 1353 to 1336, fought wars and championed a god of the universe. and a Black, feeling the sternness of Ramses II. The Egyptians were now using wheels and horses, and they had a light-weight chariot they had perfected. The chariot was fast in that neither of the two horses doing the pulling was weighed down by a rider. The chariot could turn sharply, give a smooth ride, and from it the rider could comfortably shoot arrows. It allowed an army to move quickly into battle and to withdraw before much injury could be done to it. Chariots frightened the enemy. They were the tanks of antiquity. Egypt's advance on its northern front in Syria was halted by the Hurrians. In the mid-1400s, Egypt allied itself with the enemy of the Hurrians, the Hittites, and they continued to clash with the Hurrians. The Egyptians gained wealth from booty, but they failed to push the Hurrians out of Syria. Eventually the Pharaoh Thutmose III (r. 1479-1425) negotiated peace with the Hurrians. And two successive Hurrian kings married their daughters to the Egyptian kings Thutmose IV (1401-1391 and Amenhotep III (1391-1353). In the mid-1300s, Egypt withdrew from Syria and Canaan, as the pharaoh Amenhotep IV – also known as Akhenaten – tried to force his subjects to worship the god Aton, whom he believed was the god of the universe. There was unrest and upheaval. The last pharaoh of the Eighteenth Dynasty was a military commander, unrelated to the rulers who had preceded him. The founder of the Nineteenth Dynasty, Ramses I (1292-90) and his son Seti I (1290-79) revived Egyptian imperialism. Seti went with his army into Canaan and re-established Egypt's imperial administration there. Seti clashed with the Hittites over control of Syria, and during the reign of Seti's son and successor, Ramses II (1279-13) the Hittites pushed south and retook the city of Kadesh, seventy-five miles north of Damascus. Ramses tried to retake Kadesh but failed. The Hittites, who also had chariots, outnumbered the Egyptians close to 2 to 1. The Battle of Kadesh, generally dated to 1274 BCE, has been described as involving perhaps five or six thousand chariots – the largest war with chariots ever. Both sides claimed victory. The war between Ramses the Second and the Hittites dragged on until the 21st year of Ramses' reign, when the Hittites saw a growing danger from other enemies. Ramses and the Hittites signed a treaty that they called an "everlasting peace." Egypt was to control lands as far north as Lebanon, and the Hittites were to control lands north of there. The Hittites gave Ramses a Hittite bride, and Ramses returned to Egypt. There he explained his exploits in Syria as a great victory – as he was supposed to be divine and incapable of failure. To celebrate his victory and to create symbols of his glory, he put slaves to work on the creation of buildings and monuments across Egypt. 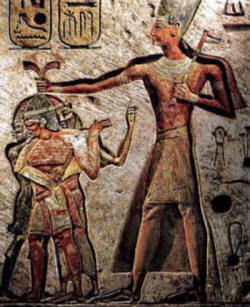 Art work from this period depicts a tall and threatening Ramses holding a Semite, an Asian and a black man by their hair – three slaves feeling the sternness of Ramses' rule. It was to be described as the time of Moses and enslavement of Hebrews in Egypt.